My husband lost his job and the prices of everything went up. He went to the city to look for work but he didn’t find anything. So Kawather started working on the farms to generate some income to feed her children, but it’s not reliable. One day I am able to buy some food. But the next day they sleep with empty stomachs. Sometimes I can’t help but cry. I am very thankful that at least we have one cow. I keep telling myself that our life is much better than many people who have absolutely nothing. Kawather’s house consists of just one room. They don’t have a bathroom, so she has to wait until it’s dark to go outside if she needs to go to the toilet. This is one of the huge indignities that women in her village suffer from. 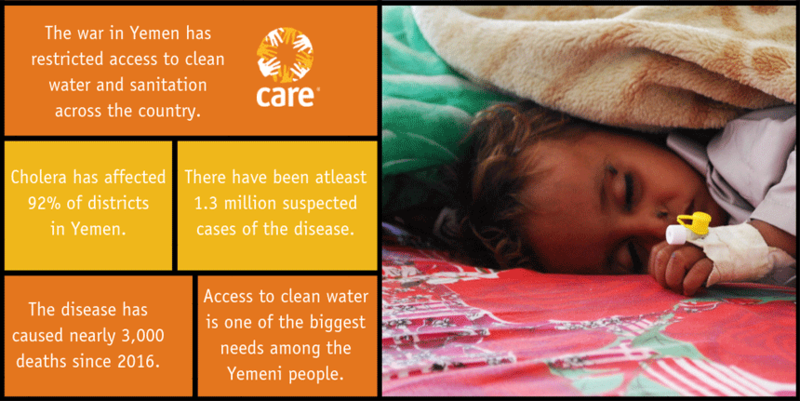 Water and sanitation is one of the most critical needs in Yemen. The lack of a fully functioning health system and limited access to safe water and hygiene has caused the worst outbreak of cholera in Yemen’s history. 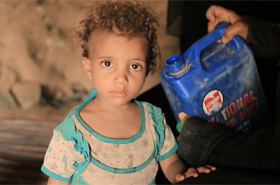 Since 2016 there have been a total of 1.3 million suspected cases and almost 3,000 deaths; 92 percent of Yemen’s districts are affected by cholera. With the rainy season coming and a surge in cholera cases, there are concerns about a renewed outbreak. Sometimes we have only of a piece of bread and milk to eat. I wish I had a reliable job to be able to afford a decent life for me and my children. I was constantly worried, crying at night. I felt like I had failed to provide a decent life for my children. I started working in people’s houses to be able to feed my children. But even now sometimes I get tired and I sit and cry, thinking about our situation. I wish this was all just a nightmare. After years of war and the resulting economic decline, job losses, and price increases, people like Shafeqa are not able to afford food, medicine and other basic items. So many people get sick because they don’t know about good hygiene habits. After I learnt about them I feel I am responsible to spread the word and share the knowledge I have. Now, I sleep worrying about how we are going to survive tomorrow, and I wake up thinking about how we are going to end our day.